So I don’t *normally* post on Sundays but the thought of keeping this from you was criminal. It is SO easy and SO delicious and I am absotively in love with it. The thought of candy thermometers give me shivers. Ughhhhhh. I get panicked thinking about rising dough. I mean, who has time for that? And yeast. It’s a powder… and I’m frightened by it. Hi, I’m Hayley, and I’m frightened by yeast. And candy thermometers. Anyway, back to candy. This toffee requires absolutely no thermometers of any kind, requires minimal effort, yet tastes rich and ritzy, like gourmet candy. 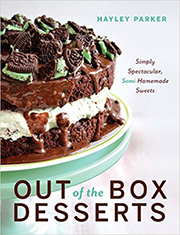 Methinks you need to bookmark this recipe for Christmastime. Hello, homemade toffee? Everyone will love you. That means more presents. You’re welcome, friends. 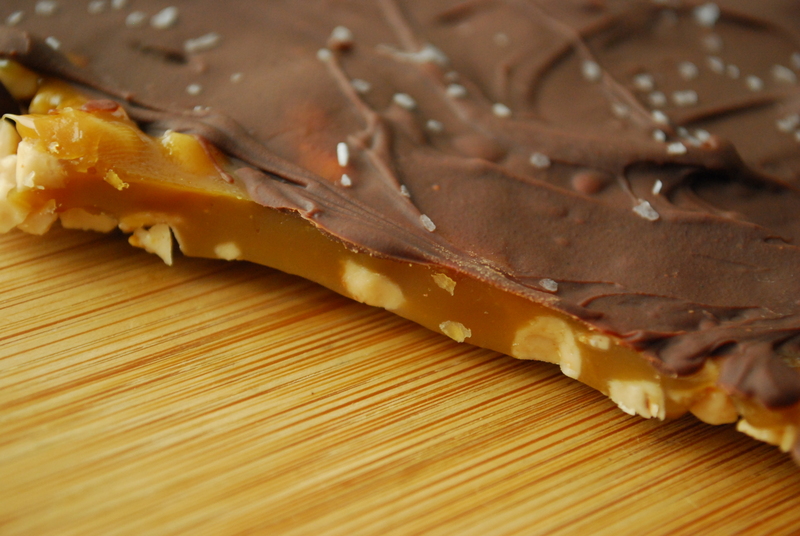 Plus, this toffee is versatile, so you can add different mix-ins to suit your tastes. I used toffee bits for added crunch + texture, and sea salt for a sweet and salty twist. Butterscotch chips would be good, or even chopped cookies. So are you making it yet?? 1. Line an 8×8 inch baking pan with foil, extending the sides over the edge of the pan. Lightly mist the foil with cooking spray. 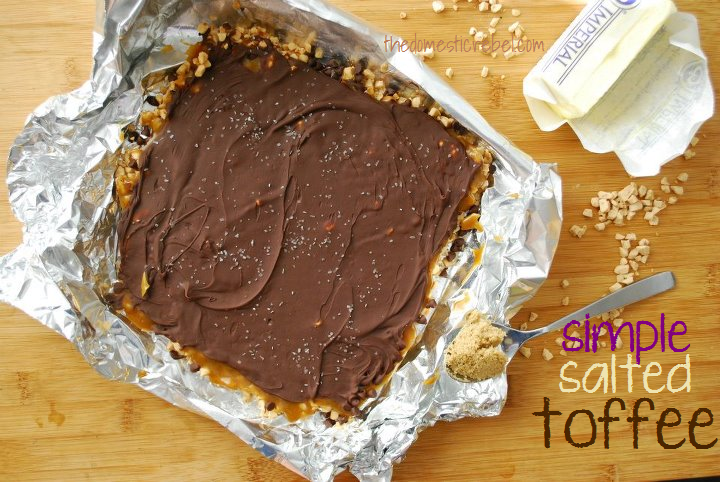 Sprinkle the toffee bits (or any other mix-in of your choice) in an even layer on the bottom of your pan. 2. In a medium saucepan, bring the butter and brown sugar to a boil. Boil for 5 minutes, stirring constantly. Mixture will be thick and caramely. Pour the bubbling mixture on top of the toffee bits, spreading to fit the pan. 3. Immediately sprinkle the chocolate chips on top. Place the pan in the microwave to sit for about 5 minutes (it just needs to be in a closed space undisturbed to help melt the chocolate chips). Spread the chocolate chips in an even layer once they’ve melted. Sprinkle immediately with sea salt. 4. Allow the toffee to harden in the fridge for several hours. 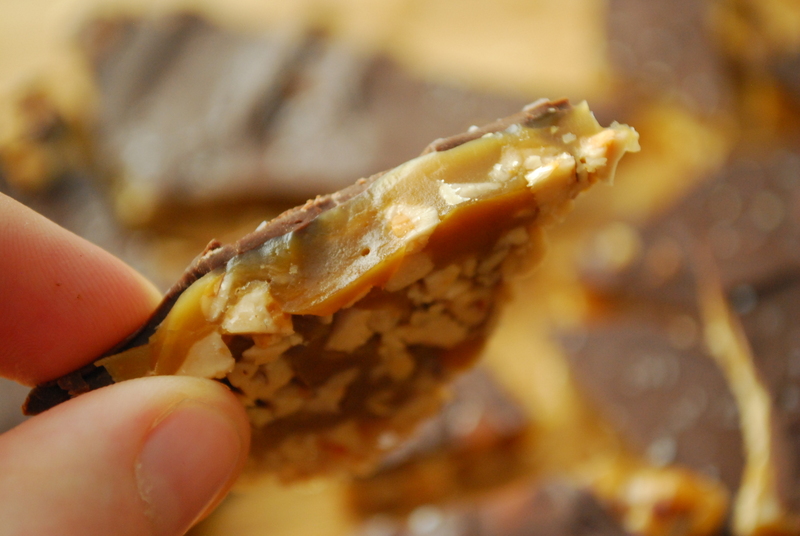 Snap the toffee into pieces. Store airtight for up to 1 week. You can store in the fridge (bring to room temperature before eating) or at room temperature. SO GOOD! I mean, just look at that caramelized butter and brown sugar. Hubba hubba. And FYI, sea salt makes everything better… but you knew that. I think you’ll get over your fear of yeast eventually 🙂 There’s nothing like the smell of fresh baked yeast bread! It’s an accomplishment. You should start with pizza dough. I think it only needs one rise and it doesn’t get any easier. Love the toffee. I know, I keep seeing fresh pizza dough and it’s like my mind creates the smellavision for me–I need to stop wimping out and make it! Maybe this weekend 🙂 and thanks Jen! 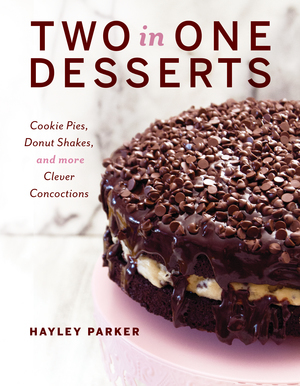 Thanks for sharing the recipe in plenty of time for me to get my mind around the fact that it’s getting to be time to plan Christmas gift goodies already! Hi June! Eeeek, that sounds like a traumatic story and I definitely understand your hesitance!! That sounds like a painful, awful mess to clean up–candy shouldn’t be a pain! However, yes, this uses the microwave only as a “holding cell”–I love that term. Glad to share with you and yes, crazy that Christmas is practically around the corner!! Have a great Sunday, June! It looks great and good for you for checking off something like this from your to-do list! 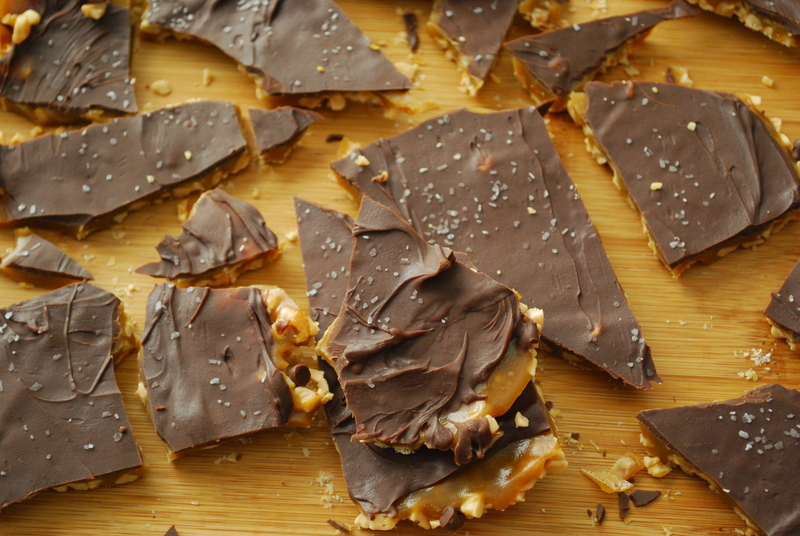 I made Saltine Toffee, i.e. Christmas Crack, as it’s sometimes called last xmas season. Similar result but slightly diff process. Boil the mixture on the stovetop, pour over saltines, bake, then top w/ choc and bake til melted. Delish! Hmmm…I have my own toffee recipe. I’ve never used yeast in it but I do use a candy thermometer because the sugar and butter mixture can burn easily if it goes beyond 300° Fahrenheit. They are cheap and I recommend investing in one. Lol, I don’t use yeast in this one! I was just saying I am scared of yeast AND candy thermoms 🙂 but yeah, I should pick one up! Any reason to head to Sur La Table or Crate & Barrel. I was afraid of yeast and candy thermometers forever. I’m over my yeast fear now, and you totally need to try. Candy thermometers…well I still hate mine but I actually use it, so that’s progress. LOVE toffee!!! Especially with more toffee inside. Hubba hubba is right! I love the toffee and sea salt combo. 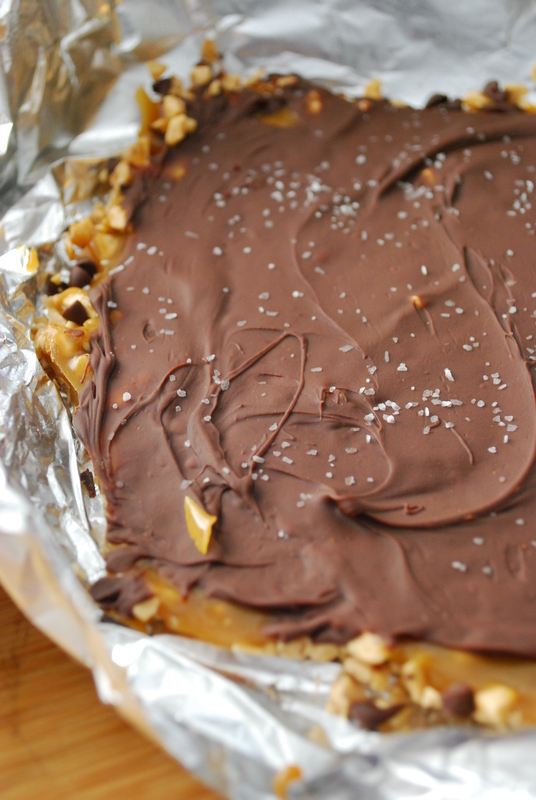 And I love you for giving me a toffee recipe that doesn’t use a candy thermometer! Totally making this come Christmas time! I love toffee! Yum, I can’t believe you don’t even need a candy thermometer for this! I love any toffee and especially with chocolate and sea salt! I’d like to link this recipe in a posintg on my blog and if possible use one of the photos …with proper credits, bells, whistles, sprinkles and maybe a pony ?? I can’t wait to make this !!!!!!!!!!!.. Girl, how do you get so many posts up in a week? You amaze me! And this toffee?? OMG, it looks so awesome. Not only could I eat the entire batch plain, but I’m guessing I’d have to make another to add into some cookies. Aaaah, the possibilities are endless! And I’m with you on Fall. It’s my favorite season…I’m totally on the countdown! Haha, the ‘I’m frightened by yeast’ made me giggle but not in the intended way. Yay for posting on a Sunday and rightly so, looks so yummy. I bought a thermometer in which I can use in candy making but I haven’t got around to using it yet. Besides the fact I have no moulds, I’mma little frightened too. I worry I’ll pour boiling sugar all over my hands then stupidly run under cold water and it latch like glue or something. I think a lot. And talk, obviosuly. 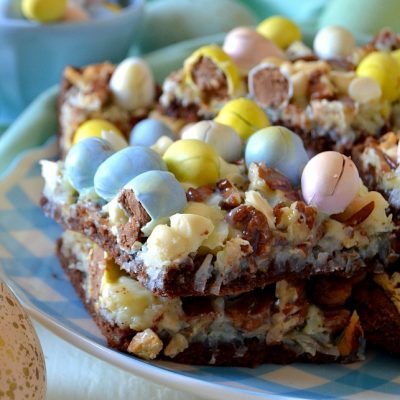 This sounds awesome… I have made the “Crack Toffee” before and LOVE it!!!! We added slivered almonds and it almost resembled almond rocca, YUMMM! Hi Meredith! When I use one stick of butter, I mean 8 Tablespoons, or 1/2 cup of butter 🙂 hope that helps! And your almond roca candy sounds fantastic! !